It's Sunday in Japan and that means more Nico Nico Choukaigi coverage! I think that most of today's content will be very similar to what was shown yesterday. Don't forget that you can use Nico Nico's Timeshift feature to reserve and view the live streams even after they've finished. They'll expire on 2nd May 2015. Just like yesterday, the first panel was the Sengoku Basara 4 Sumeragi 'super' latest information corner on the Sengoku Basara 4 Sumeragi VS DMC4 SE Nico Nico channel. They opened up with the old PV from Basara Matsuri again but this time YamamotoD provided commentary over the top to introduce the new characters to viewers. He mentioned some kind of drama between the Setouchi characters. They then went through the new characters with slides. Since it was a repeat of yesterday's information, the tone was much more informal today. KobaP joked that Yoshiteru's time-stop roulette result was like 'The World' from a certain popular shounen manga and later they described Katsuie's new medal outfit as his Turn A Gundam costume. When they got to the returning NPCs KobaP introduced the Uesugi ninja as the 'super-popular Kasuga-chan'. Other things I picked up were that fans can expect to see an Akechi Mitsuhide costume in the medal rewards and Mitsunari's skill revision lets him cleave the ground. 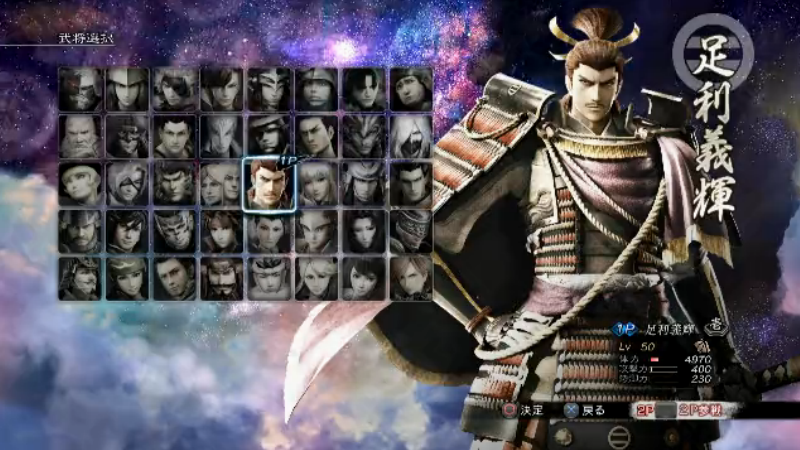 YamamotoD referred to the scenes of Hideyoshi holding Mitsunari and Ieyasu up with his arms and confirmed it was a reference to the two of them being the Left Arm and Right Arm of the Toyotomi in one of the scenarios. This setting was also used in the last stage play, so I guess those who have seen it might have a few ideas about how the story will develop. I'm not going to spoil it here. 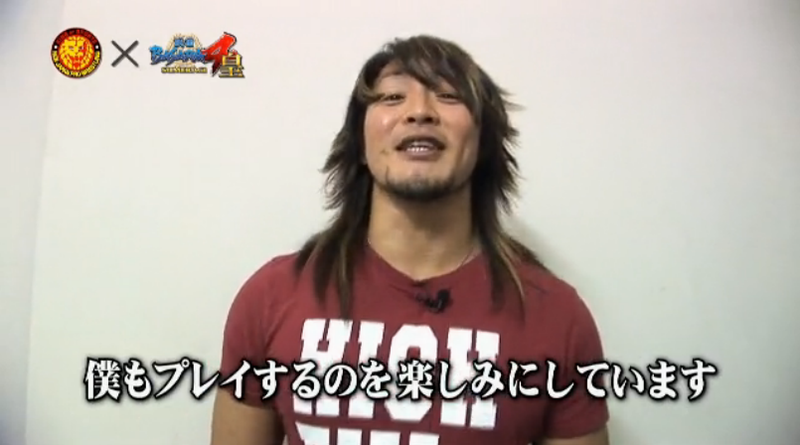 We also got two new video messages from the other NJPW wrestlers who weren't featured yesterday. They both seemed sweet and said they were looking forward to the game. YamamotoD went into a lot of detail about Sen No Rikyuu's Giga Basara imagery during the discussion about the game's theme songs. The title of Ishikawa Chiaki's ending theme Heavenly Blue can refer to the distinctive colouring of the morning glory (asagao) flowers that Sen No Rikyuu is famously associated with. The plants in his ink artwork are morning glories too and the two infants represent Wabisuke and Sabisuke. The next panel I tuned in for was the gameplay preview session. For some bizarre reason Capcom TV decided to run a Sengoku Basara 4 Sumeragi gameplay preview on their YouTube channel at the exact same time so it was very confusing keeping track of both. The dedicated Nico Nico stream had much better commentary and gameplay. 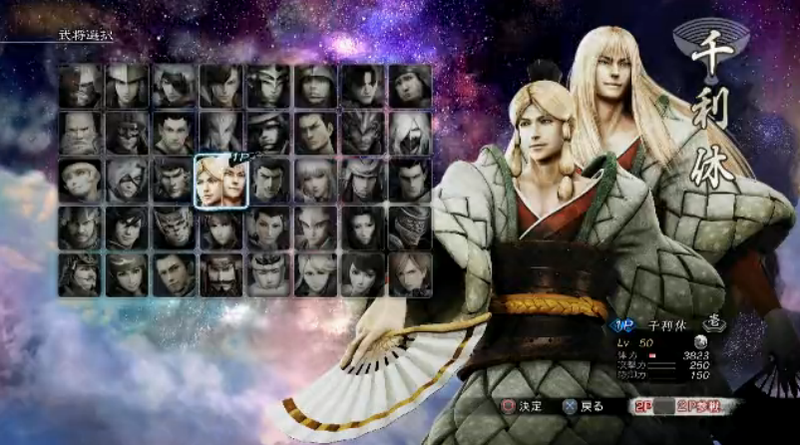 They showed the character select screen in Free Battle mode. You can see Yoshiteru's new (very pixellated) elemental symbol in his profile. Gatchman was lucky enough to get the Akatsukimaru transformation in Battle Roulette during his Yoshiteru gameplay session so he demonstrated how quickly it could move; it zoomed through the stage leaving a trail of destruction. It was shown yesterday too but the four different elemental attacks from Yoshiteru's Senban No Kiwami ('The Lathe's Zenith') R2 special are named after the classical four gods. They are Genbu (a blue ice effect), Byakko (lightning), Suzaku (fire) and Seiryuu (a dragon made of darkness). Missing with this move is what triggers the panels which cover part of the screen. Missing with his main roulette move triggers seals which appear on his body and weaken Yoshiteru; I think they said it locked his Basara for a short time but I'll have to check properly later. The second character Gatchman demonstrated today was Maria. Her third special where she controls the camera is quite hard to pull off; she can be knocked out of it easily. Her first special seems to be the move where she grabs the enemy's attention by blowing a kiss at them then wraps them up in cloth. Even though all of the demonstrations are on the easiest difficulty - only Normal and Hard were available in the version on display - poor Gatchman was almost wiped out when he rushed to the end to fight Shingen and Kenshin. The third demonstration was Sen No Rikyuu. His elemental symbol can also be seen on the character select screen. 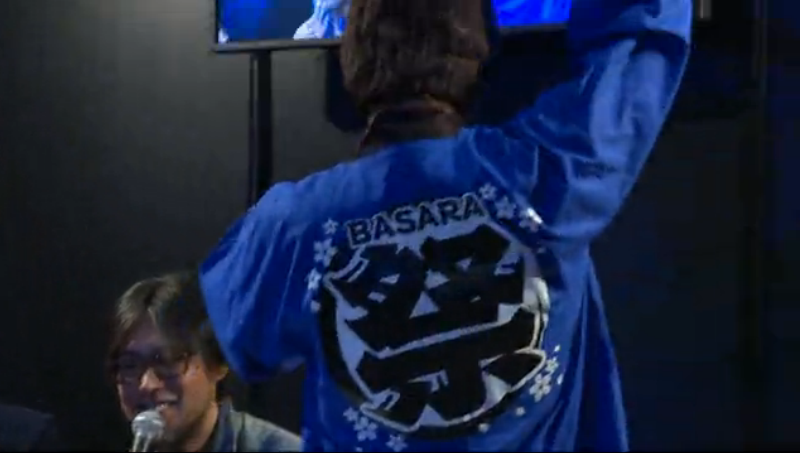 Just as the demonstration was getting started, the costume-clad 'Bokesuke' wandered over from the Capcom TV presentation and gatecrashed the broadcast. After some silly banter he sat down and joined in with the gameplay commentary. Bokesuke is a fictitious third personality who is supposedly signed up to the famous Yoshimoto talent agency (alongside Wabisuke and Sabisuke, of course). He's played by real-life comedian Osada Shouhei of Chocolate Planet. During the Capcom TV stream a little earlier he'd come on stage and introduced himself with the fake announcement that Chocolate Planet was changing its name to Green Tea Planet. I suppose it makes a change from the usual booth babes! Once Bokesuke left the players went back to demonstrating the game properly again. They showed a Giga Basara attack with Rikyuu and Yoshiteru and had some fun with tagging, then went ahead and finished the stage. 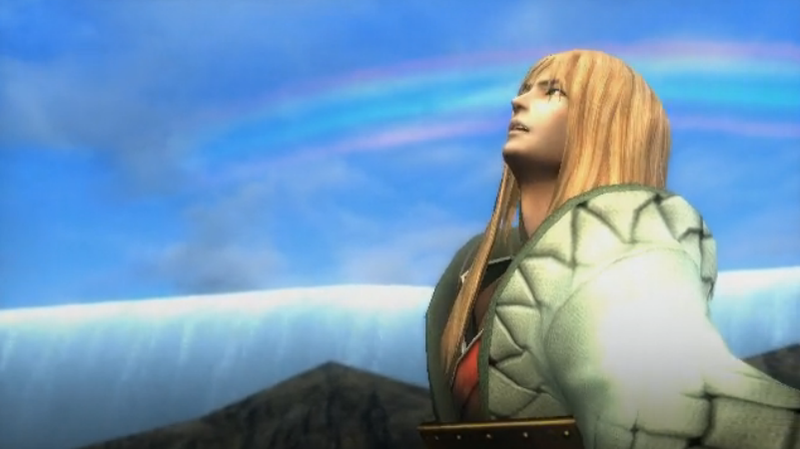 As a treat they let the viewers see Rikyuu's victory sequence, which switched between both identities then showed Sabisuke blasting of into the sky. The next panel was KobaP's Super Talk Room. His first pair of guests was Yokoyama Masayoshi of Sega Games (series producer for Ryuu Ga Gotoku) and Ichimura Ryuutarou of Square-Enix (series producer for Dragon Quest). Both men were very talkative and engaged. 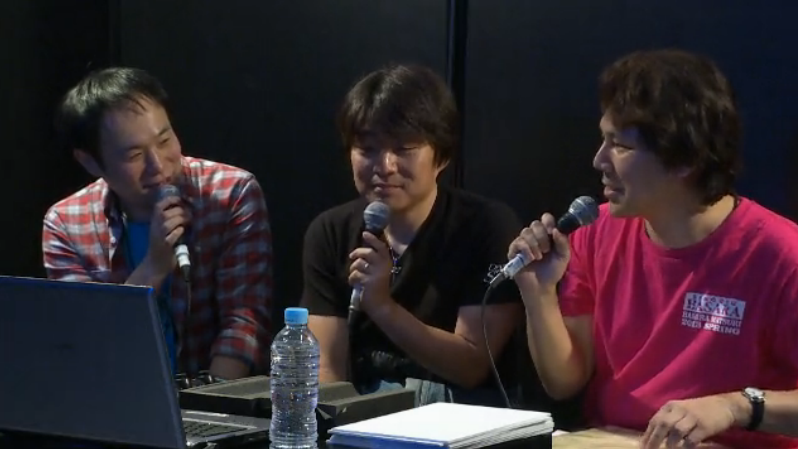 They introduced their own titles first, then the discussion turned to Sengoku Basara 4 Sumeragi and other Capcom games. Yokoyama thought Yoshiteru was cool and would fit right in with the Ryuu Ga Gotoku (Yakuza) games. He was amused that they'd managed to make a version of Sen No Rikyuu which was completely unlike any other, even though he's been portrayed in numerous ways in the past. 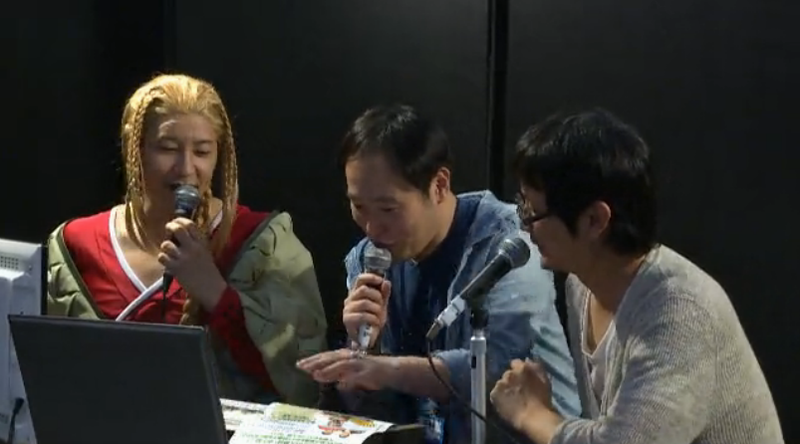 He praised KobaP's team for being able to make great female characters like Maria. In comparison, they're not so good at making women for the Ryuu Ga Gotoku series. Ichimura is familiar with both Sengoku Basara and Tales Of Zestiria and thought the characters suited their crossover costumes rather well. Yokoyama joked about having the Ryuu Ga Gotoku characters dressing up like musician Himuro Kyousuke when he saw Ieyasu's T.M.Revolution costume. Ichimura asked KobaP whether he could pose like T.M.Revolution and he was more than happy to give it a try mid-discussion. Ichimura is interested in pro-wrestling so his face lit up when they got to the NJPW tie-in. He thought it was very well done. Yokoyama is pleased to see classics like Devil May Cry 4 returning on current consoles so that people can play them again. He thinks it's a good idea to make older titles available on new systems where they can continue to be enjoyed. Ichimura has various things planned for next year's 30th anniversary celebration of the Dragon Quest series. Speaking of anniversaries, it's the tenth anniversary for Ryuu Ga Gotoku too. The release of Ryuu Ga Gotoku 0 was just one of the activities they have planned. 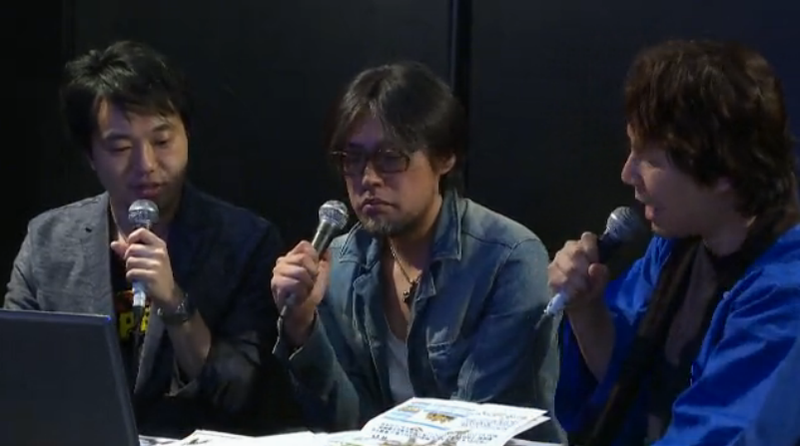 Once the discussion was over, KobaP was joined by the next set of guests: Matsuyama Hiroshi of CyberConnect2 (company president) and Harada Katsuhiro of Bandai Namco Entertainment (Tekken project leader). 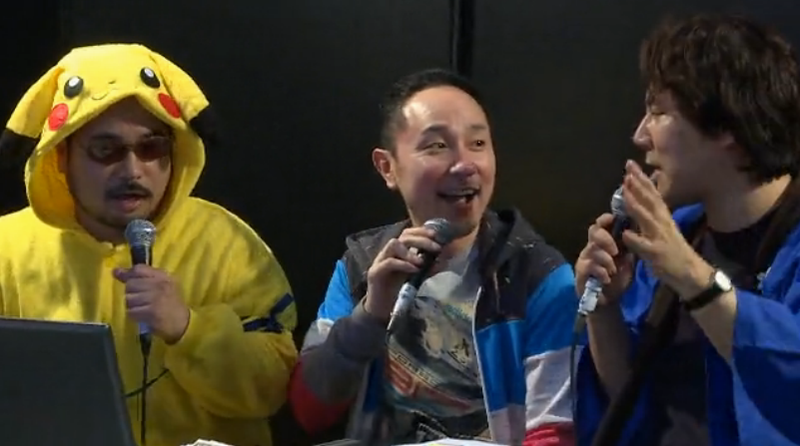 Harada was wearing a Pikachu onesie as tribute to Pokken Tournament and he'd decorated it with a blue ribbon - a reference to Hestia from anime DanMachi and a recent meme. It was difficult to pay attention properly with Harada dressed in such a ridiculous manner and the conversation was even crazier than the last one. Matsuyama got super-excited about Yoshiteru and the guests both agreed he resembled Char Aznable from Mobile Suit Gundam. Matsuyama exclaimed that Rikyuu was the first time he'd ever seen anyone use the foreign loanword 'psychic' to describe someone from the Sengoku era. He calmed down after a while and said it was typically 'Basara-ish'. Harada joked that he wanted to stop this sort of messed-up representation of Japanese culture from spreading worldwide. Matsuyama asked whether Maria's weapon was really cloth - surely a whip? Harada asked why 'Sengoku' was even in the title any more when it had become such a bizarre jumble of nonsense, especially with all of the different tie-ins. All three men were laughing helplessly by this point. 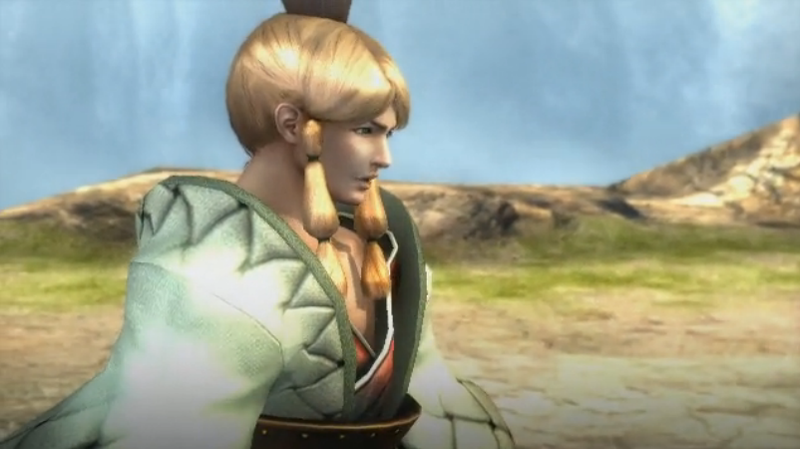 With regards to the Tales Of Zestiria collaboration, Matsuyama thought that the fantasy-style hairstyles characters have in Sengoku Basara made the crossover work well. When they got to Ieyasu's T.M.Revolution costume, Harada asked KobaP who this kind of thing was aimed at, exactly, "Who asked for this??" 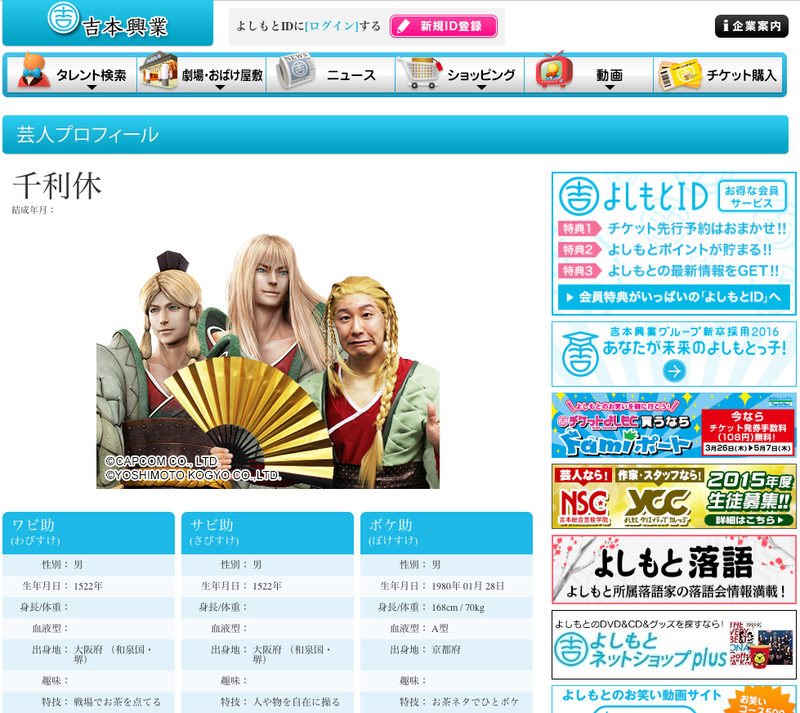 KobaP said that both the fans of the series and T.M.Revolution fans were interested but Harada still seemed skeptical. The NJPW collaboration left both guests speechless for a while, yet they were impressed. Matsuyama finds it fascinating that Harada is so active in marketing his games to a global audience (he's often active on Twitter soliciting feedback from fans in English, even though he gets a lot of trolls). They talked about what kind of game they'd make if their three companies collaborated (there was no real consensus because they kept getting distracted by other topics. It was another presentation which was deeply funny if you could follow the Japanese but there were no visual aids for anyone who couldn't. The last event of the day was the second Challenge Gatchman! Sengoku Basara 4 Sumeragi 'Super★Bomb Soldier Challenge'. The stages were the same as before and since it is a special build of the game it's hard to say whether any conclusions can be drawn from the gameplay that was shown; a lot of the Nico Nico commenters were hoping for lots of enemies on screen at once and complaining about how expensive it was to buy a PlayStation 4. The second player from the audience was a young man who said Sasuke was his favourite character so while they were chatting YamamotoD confirmed that Sasuke was definitely getting a drama route in Sengoku Basara 4 Sumeragi (it was also mentioned the day before). During the challenge they managed to sprint to the end and clear the entire stage (proving that Sasuke was a sub-boss in the process). Sadly the bomb soldier didn't have his own victory sequence. Once the challenge session was over, Capcom announced that players at the demonstration area in their booth had managed to earn a total of 173,786 medals today for a total of 373,820 over the weekend! Even if the medal rewards are less common in the actual game than in the trial version, it looks quite easy to acquire them. Bonus: Notes from yesterday's 'Party with KobaP and the developers!' panel. I didn't cover this at the time as I'd been watching the live streamsall night long and was exhausted, so I watched it today instead. KobaP sat down with directors Itsuno Hideaki (Devil May Cry 4 SE) and Yamamoto Makoto (Sengoku Basara 4 Sumeragi) to discuss various behind-the-scenes trivia now that both of the new games are approaching release. Itsuno suggested that if he had the chance he'd like to work on a new fighting game like Star Gladiator or Shiritsu Justice Gakuen (Rival Schools). YamamotoD had to talk about something that KobaP did which he considered reckless. He chose the pace of release for new Sengoku Basara games, joking that eleven games in ten years was rather unusual. At one point the dramatic conflict between Ieyasu and Mitsunari in Sengoku Basara 3 was compared to an afternoon soap opera, which caused a lot of mirth on Twitter (and in the panel itself). YamamotoD was asked which aspect of the game they put the most effort (i.e. money) into working on. His answer was immediate: the playable characters. They've adjusted the balance in Sengoku Basara 4 Sumeragi as they regretted making some aspects of Sengoku Basara 4 disproportionately difficult. The commenters on Nico Nico were guessing this might relate to improvements to the camera or Yoshiteru's noticeable toughness when compared to other bosses. One of the reasons SCANDAL were chosen to provide the ending song for Sengoku Basara 4 was to give it a youthful feel to match Sakon and Katsuie. But of course the real reason is that YamamotoD happens to be a big SCANDAL fan. It takes about a year to produce a Sengoku Basara or Devil May Cry game. About half of that time is spent on active development. Towards the end of the segment the three creators read the comments from the Nico Nico viewers and responded live to their ideas. Both directors laughed when they were asked about the next major games in their respective series, Sengoku Basara 5 and Devil May Cry 5. YamamotoD protested that they were still working on the current games! A crazy number of suggestions popped up in the comments at this point, with fans clamouring for such varied things as scenes from Yukimura's past, playable Bontenmaru, happiness for Oichi and more about Katsuie's past. There were lots of fanciful crossover ideas suggested such as a Devil May Cry Takarazuka musical, more Gakuen Basara projects, fighting game crossovers, a Sengoku Basara concert; the directors were interested reading what everyone thought. Someone asked whether Sasuke was going to have a drama story and YamamotoD answered that he would. Lots of comments asked when the Butai Sengoku Basara 4 DVD was coming out (yeah, where is it?). My respect goes to the person who asked them to make a Ryuu Ga Gotoku (Yakuza) tie-in costume for Kojuurou. KobaP read out another comment which mentioned wanting a Sasuke figure of some kind. 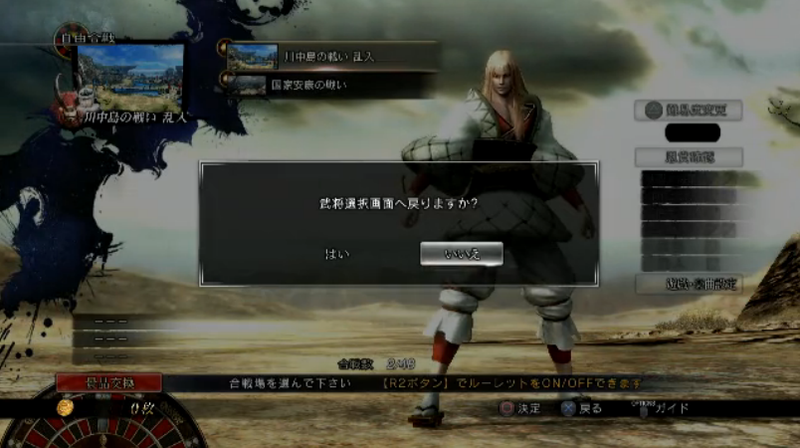 When he plays Sengoku Basara, Itsuno likes to use Kanbee. YamamotoD asked the audience whether they were more interested in Wabisuke or Sabisuke. The response was varied with neither dominating the vote. The fans then suggested a new addition which made everyone laugh: Xavisuke. 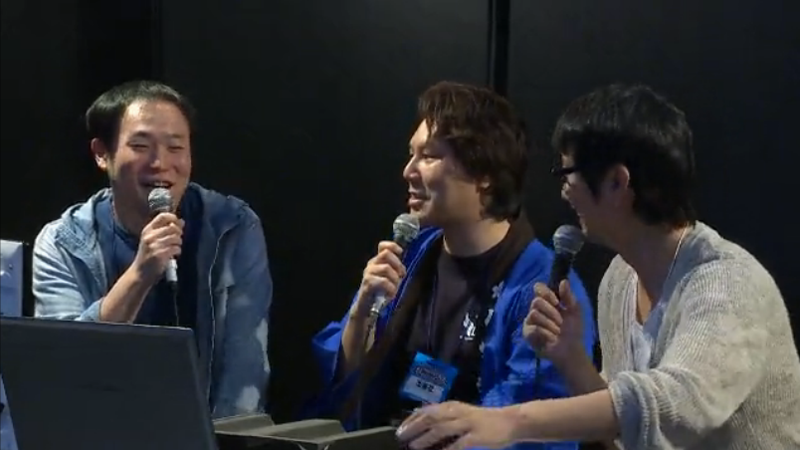 They talked nostalgically about all of the old characters who aren't included in Sengoku Basara 4 Sumeragi like Ranmaru, Nouhime, Kennyo, Musashi, Ujimasa... they even remembered the Gohon-yari. KobaP joked about introducing a tanned Okinawa-themed version of Itsuki called Satsuki. There was also occasional coverage on the Capcom TV YouTube channel which can still be watched now that the event is over. Please note that I have nothing against DMC but I didn't watch those shows because I didn't want to miss any Sengoku Basara coverage. I missed all this and I'm curious what happens when Maria controls the camera in her special move. It was quite hard to see how the move worked. I don't know why Maria's gameplay wasn't shown in the YouTube presentations too as the video quality is much better there. I'm guessing the next Famitsu write-up will give proper descriptions of all of her antics. They didn't answer the stage play question, annoyingly. I hope we'll get some news very soon. Urgh, I should've been there for this dev roundtable on NN. ;_; I would have blathered nonstop to them about the Uesugi in my admittedly poor Japanese. Deep regret. I'm oddly giddy about hearing Yoshiteru's moves ARE based on the directional guardians though. Not sure why, just... it's a nice touch.